Click here to download a work permit application. If you are looking to obtain an ENTERTAINMENT WORK PERMIT, you need to contact your academic counselor for approval. Download the application here. All minors under age 18 (including minors employed by parents) must have a work permit. Work permits must be renewed at the start of each school year or at the the time a student obtains a new job. In order to obtain a work permit and keep it valid, a Santa Susana High School student must attend school 90% of the time AND maintain a 2.0 GPA. In addition, a student who has more than 6 periods of truancy will lose the privilege of working in our community. Records will be reviewed regularly and work permits will be revoked for students who do not meet these requirements. 4 hours max. per day, Mon. – Thurs. 8 hours max. per day, Fri. – Sun. 36 hours total max. per week. If no school next day, until 12:30 a.m.
8 hours max. per day, any day. 48 hours total max. per week. 5:00 a.m. to 12:30 a.m. any day of week. 3 hours max. per day, Mon. – Fri.
8 hours max. per Sat. – Sun. 18 hours total max. per week. 7:00 a.m. to 7:00 p.m. every day of the week. 40 hours total max. per week. Under 14 years of Age: Federal and State laws prohibit the issuance of work permits except in very limited circumstances. Contact the Department of Industrial Relations or the high school Work Experience office for more information. Do I need a work permit over the summer? Yes! All minors need a work permit year-round. Where can I get a work permit if I find a job during summer? 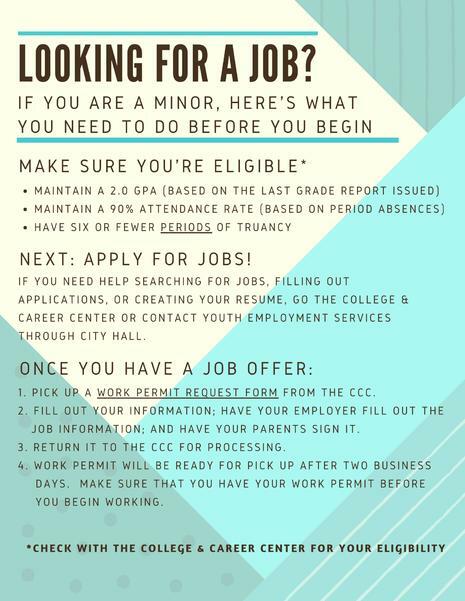 Through June 13th, you can request a work permit through the CCC at SSHS. The CCC will be closed for summer beginning June 14th and you will need to request a work permit through the front office with Mrs. Hypes or at Simi Valley High School during summer school. I don't have a 2.0 GPA. Can I still hold a job over summer? Yes, however, you will only be able to work over summer. All work permits issued throughout the school year and during summer expire five days into the next school year. In order to renew your work permit, your grades and attendance will be re-evaluated and if you do not meet the minimum eligibility criteria, your work permit will not be renewed. Yes, but you need to obtain a work permit for each job you hold. Additionally, the hours listed on your work permit is the total number of hours you are allowed to work among all jobs you work.